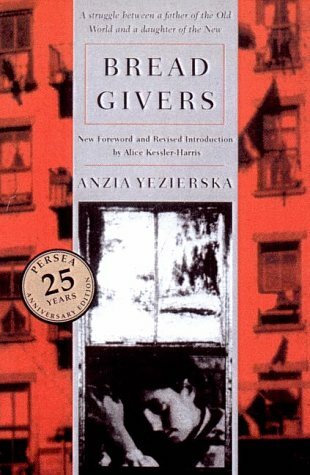 I purchased Bread Givers by Anzia Yezierska a few years back while my family and I were in Washington D.C. We toured The Holocaust Museum, which was heartbreaking but informative and well worth the tour. Afterward we spent a few minutes browsing the museum kiosk store. This book's synopsis caught my attention so I bought it, brought it home and added it to my bookshelf. Maybe I should have read it right then but I waited four years and pulled it off just recently. My thoughts: You can see why the book appealed to me. Sara is an intense character who, as the youngest, watches all these family mistakes play out. Rather than allow her father to ruin her own life she strikes out on her own, leaving behind her mother, father and sisters. Her sisters make fun of her even as they complain about the terrible marriages their father has forced them into. Father's love of the Torah and studying are completely (for lack of a better word at the moment) CRAZY! He takes the Torah at it's word only as it applies to help his cause. The struggle between family members, old and new traditions, right and wrong are so fanatical and vivid-I raced home every night to read a few more pages before making dinner. It made me grateful for my own father who was very forward thinking and giving of his time and thoughts, unlike Sara's father, who never listens and always talks with bitterness. Not only were the characters memorable but the language was extraordinary. This book will stay with me for a long time but only in spirit because as per the Reading From My Own Shelves Project I must depart with it-I'm glad it is going to a good home. Tina graciously accepted to take it home with her. "Father," I cried. An then my voice stopped. For I suddenly became aware of his cold, hard glance on me. "Is it true what Max Goldstein said?" His eyes glared. "Is it true you refused him?" Not a word could force itself out of my tight throat. "Answer me! Answer me!" His voice grew louder and harsher. "It wasn't the real love," I stammered, hardly aware what I was saying. Whatever you're reading today-I hope you are enjoying it! I'll be reading and lesson planning while the game goes on but if I had to root for a team it would be the Green Bay Packers. Why? Because I've read about both quarterbacks and Aaron Rodgers wins in my book. "I'll show you how quickly I can marry off the girls when I put my head on it." "Yah," sneered Mother. "You showed me enough how quickly you can spoil your daughters' chances the minute you mix yourself in. If you had only let Mashah alone, she would have been married to a piano-player. ""Did you want me to let in a man who plays on the Sabbath in our family? A piano player has no more character than a poet." "Nu-Berel Bernstein was a man of character, a man who was about to become a manufacturer." "But he was a stingy piker. For my daughters' husbands I want to pick out men who are people in the world." "Where will you find better men than those they can find for themselves?" "I'll go to old Zaretzky, the matchmaker. All the men on his list are guaranteed characters." "But the minute you begin with the matchmaker you must have dowries like in Russia yet."